I was watching tv one morning, flicking through channels when I saw an advert for this, and I thought, well, I have these 3-4kg I never seem to be able to get rid of, no matter what. Also, I wanted to see if I can increase my stamina. Maybe this would do the trick? I started week 1 at 53.8kg, chest 83cm, waist 71cm, thigh 57cm – ok, hardly big, but there’s room for improvement, my ideal weight would be 50kg, I could even go down to 48kg and still be in the healthy zone. I have been trying to lose the last 4kg for years. When I say trying, I’ve been thinking about it but not doing much. When I say not doing much: I cycle, run and do capoeira – so I have been doing a bit! I was burning an average of 300 calories a day through exercise (remember, I’m small, so I burn less calories) before T25. Even with T25, I don’t think I’m burning much more than 150 calories per session, but the point of it is that you continue to burn more after as well. I went up to 60kg when I injured my hip and stopped jogging for a nearly 18 months, back in 2010-2011. Zumba, cycling, capoeira, and back jogging again from December 2011, brought me back down to 54kg (1 stone lighter). Week 2 was weird, I was on Ibuprofen for my shoulder injury (which has cleared, I’ve been discharged from physio), my weight went up to 55.2kg, not been that weight since after Christmas. Measurements were the same. Week 3, down to 53.5kg, but still same measurements as week one. I wasn’t following their diet plan, just adjusted mine a bit (see below). The most important thing, if you are doing it first thing in the morning, is to have something light to eat. I’m having either fruit or a yoghurt if I do it in the morning. Tried doing it on an empty stomach but it just wasn’t possible, no fuel. Week 4 was a pleasant surprise! I won’t be able to do week 10 as we are going away for 3 weeks. Of course that could be my downfall! 😀 No capoeira/cycling/T25 for 3 weeks! Will try and go for runs but it’s going to be very hot. On Monday 07/07/2014 (3 days after measurements above) I got my lowest recorded weight in recent years of 51.6kg, and same this morning… So that’s 3kg in 5 weeks, if we ignore the freak rise to 55.2 in week 2. Then I started the Beta cycle on week 6, Speed 2.0 is absolutely brilliant, I think it’s my favourite workout so far, will keep on doing that one once it’s over. I also got Hip Hop Abs, as it was on sale. And Saun T is sooooo fabulously camp on it, I only did the Hip Hop party on the first cardio DVD, but he actually made me laugh quite a few times during the workout. I do love dancing. Must get the Zumba dvds out again. In terms of stamina… My running actually suffered at first. My runs were slower (I was doing T25 in the morning, then running twice a week as usual, in the afternoons instead of mornings). My times were slower by about 20s per minute on average. Then I had my fastest 5km (29:48, av pace 5:57 min/km) on Week 6 Monday and my 6th fastest 6km (av pace 6:16 min/km) on W6 Friday , I wasn’t even tired at the end of it! It could be coincidence though, I know from experience with running it’s peaks and throughs – but two fast runs in sequence is a good sign! Especially when I’m doing T25 in morning. Diet wise, eating more bananas, apples and satsumas, and drinking High5 Zero Electrolyte Drink Tablets to avoid cramps (I had a few last year in Brazil!). Also I started eating a bit more meat, I was only eating red meat once a week, then fish or vegetarian for the rest, now I’m having a little more. I have a protein drink but I only have twice a week, i.e. when I do T25 in the morning then jogging, to aid recovery. I’m not spending money on shakeology or any other vitamins/food supplements. On Tuesday of W7 I did my fastest bike ride< to work. Then normal speed on the way back, but it did mean I suffered doing Core Cardio afterwards! I just couldn’t finish it. On Thursday of W7 I ran my fastest 6km ever (av. pace 6:01 min/km)! EVER! And that was the morning after a pretty intense capoeira class. It was also one of the hottest days of the year, so I ran at 7am when the temperature was around 19c, this time in the morning. I’m really starting to see a difference now… Not sure why I look more tanned on the second photo, haven’t been sunbathing. It’s just the light. Day 49 (end of W7) 18/07/2014 – I’m not holding my stomach in, by the way! 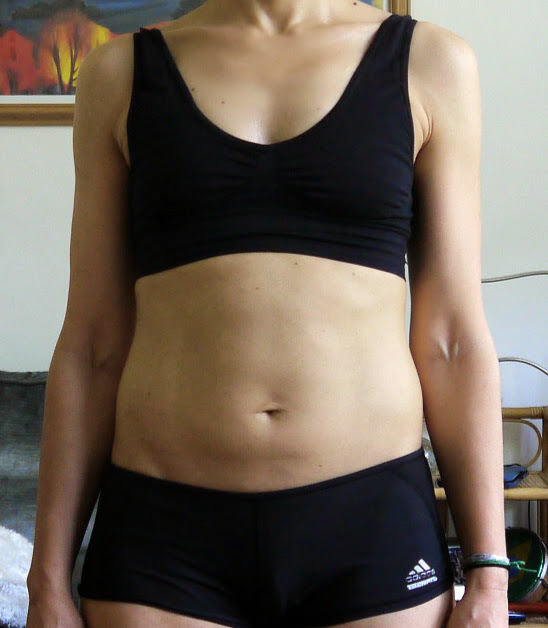 Onto Week 8 – : Weight 51.9kg, chest 82cm , waist 69cm , thigh 54cm, hip 90cm. Your body gets used to exercise pretty quickly, this week I read somewhere that sometimes in three weeks the body adapts, I think my body has adapted to this. Monday was a bit of a struggle due to hangover and much naughty smoking at the weekend. I used to be a heavy smoker for 16 years, when I turned 30 I started seriously trying to stop and I have been mostly successful but every now and then I’ll have a binge. Last Saturday was our batizado, big party afterwards, and on Sunday: Lambeth Country Show. A big social event, lots of friends there. I threw away 1/3 of a pack of B&H at the end of the day, but still I smoked a lot! 🙁 Even running on Tuesday was affected. No change on the way my body looks so no pics. I actually looked a bit bloated for a couple of days, but that was the usual water retention prior to my period arriving. And I ate like a horse on Tuesday, my appetite was insatiable! I literally ate all day. Another PMT symptom. I completed Week 9 but forgot to take measurements down, we fly to USA on weigh-in day, Saturday.